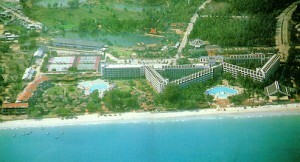 There is a wide variety of accommodation in Hua Hin. Peak season in Thailand is December – February and rates are highest during this time. Weekday rates are generally lower than weekends throughout the year. 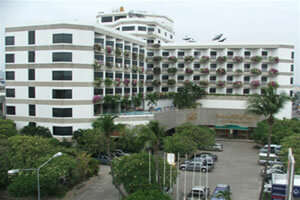 Hua Hin hotel rates are also often reduced for extended stays. In addition, there are many condos and small houses available for rent in the area. Hua Hin rentals can be difficult to find during the high season but there are many agents that can help with Hua Hin rental situation. Luxury villas can also sometimes rented for a few months. 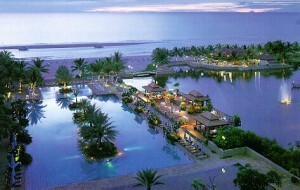 Hua Hin is an ideal spot for a family vacation. Many tour agencies offer vacation packages offering reduced Hua Hin hotel rates, tours, green fees and transport in the package. There are also all-inclusive resorts here where all meals and accommodation are covered. Basic golf packages are also available for those making their own resort reservations. For those wanting a smaller boutique resort there are also very private pool villas available. Many of the larger chains have hotels and resorts in Bangkok, Chiang Mai, Pattaya and Hua Hin so transferring from one location to another can be quite simple. Full spa facilities are more and more available at the larger hotels. The Dusit Resort and Polo Club is the perfect place to escape for some beach side relaxation. There are over 300 rooms, five restaurants, four bars, and one of the largest pools in Thailand. The pool and gardens are reason enough to visit this resort. Service is excellent. As the complete resort, the hotel also provides an extensive choice of sports and recreational amenities, including a comprehensive range of water sports, tennis and squash courts, fitness center, horse riding track and the Palm Hills Golf Course is right across the road. The San Marco restaurant hosts the resort’s ever popular ‘Pasta Factory Buffet’ every Wednesday. 1349 Petchkasem Rd., Cha Am. Tel: (032) 520-009. The Dusit also hosts the Annual Cricket Six’s Match This international cricket match is held early April. With over a dozen teams competing from around the world, the local Hua Hin Hopalongs have their work cut out for them each year. Come see cricket the way it should be played–for only 50 minutes a match. If you’re planning on coming to Thailand or Hua Hin for the Songkran Festival, and enjoy cricket also, then come a few days early and you can do both. After many years of traveling in Thailand, this is probably one of my favorite of all Thailand hotels. There’s been nothing like, at the end of a long drive north from Had Yai, arriving at the Dusit to be walked to my room by a charming and friendly staff person, then to have a long cool one on my balcony overlooking the magically lit pool. Then it’s back to reality when I turn on CNN to catch up on the news of the day while I call Bangkok to check the email. I never had the time to sample most of their facilities but I have many fond memories of the service and view. The best views of the Gulf and town are probably from the high-rise Hilton Hua Hin Hotel built on the beach on Naresdamri Rd. Choose either the wide beach or the huge swimming pool to work on your tan. 33 Naresdamri Rd. Tel: (032) 512-888. Set among 14 acres of landscaped gardens the Anantara Hotel has 162 rooms and suites, each with a balcony overlooking either the gardens or the beach. In addition to other sports activities and its spa, the Anantara now offers sea kayaking. Sea kayaking in the Gulf of Thailand can be challenging and relaxing at the same time. 43/1 Petchkasem Beach Rd. Tel: (032) 520-250. Putahracsa Hua Hin allows guests to combine the charms of small town leisure together with a beach hideaway. Situated in the residential section of Hua Hin, Putahracsa is designed to feel like a beach residence. All rooms and villas reflect the owners’ personal touch, incorporating Hua Hin’s tradition and blending it with contemporary design. Luxury rooms and private villas. 22/65 Naeb Kaehat Rd. A small exclusive beach boutique hotel featuring five modern stylish rooms with very personalized service. 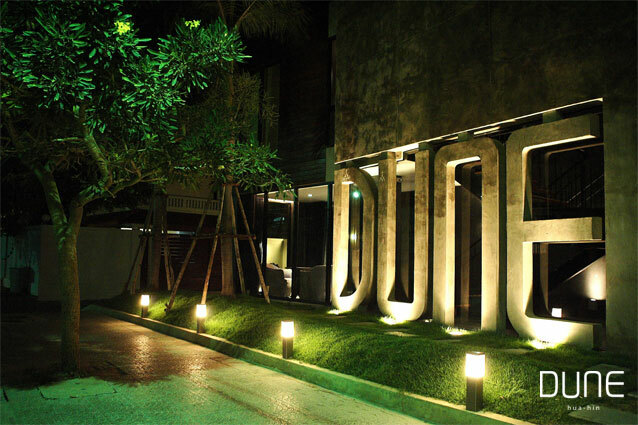 Dune enjoys a charming location on the main Hua Hin Beach within a very short drive to the town center. You will be indulged with privacy and tranquility in the comfort of your fully equipped room, while a lovely beach is only a stones throw away. Suites, roof top fusion restaurant and pool. 5/5 Naeb Kaehat Rd. The hotel is designed in a Thai style with uniquely laid out tropical gardens and stylish private pools. 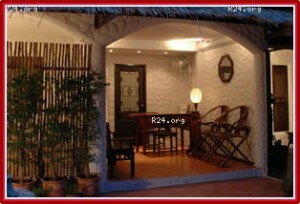 Yet also decorated and furnished with antique Chinese style windows, doors and furniture. This creates a unique blend of oriental taste combined with modern practicality and function. Boutique in every sense of the word, Baan Talay Chine Hotel and Resort comprises only six private suites and offers truly personalized service. The professional hotel staff are always ready to make your stay a relaxing and enjoyable one. 2/53-54 Naeb Kaehat Rd. This high-rise hotel on Petchkasem Rd has 168 rooms and suites. There are several restaurants in the hotel and plaza, including coffee shops, a Sukiyaki restaurant and an Essan restaurant. Other facilities include fitness center, swimming pool, snooker club, beer garden, karaoke lounge, disco and conference rooms. There is also a very popular night market only a short walk away. 222/2 Phetkasem Rd. Tel: (032) 511-499. Not the newest hotel in town but very centrally located. Close to shopping, the beach, pubs, fast food outlets and several night markets. A favorite for golfing groups as the oldest golf course in Thailand is only a five-minute walk away. Experienced staff and good value for money. Pool with afternoon shade, restaurant, and good parking if you’re driving in Thailand. 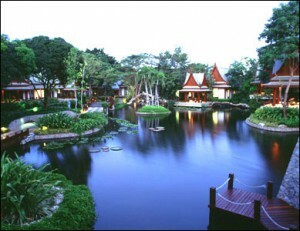 Located about 20 km north of Hua Hin, the Regent Cha Am is a village in itself with over 650 rooms, suites and cottages. In addition to the low-rise hotel, there is also a 3-story Mediterranean Style complex and the Regent Cottage addition offers thatched-roofed villas where one may enjoy a private view of the beach. There is a shopping arcade, mini-golf, tennis courts, swimming pools, fitness center, putting green, beautiful gardens and sailing activities. There are several restaurants serving French, Italian, Thai, Chinese and sea foods. 849/21 Regent Cha Am Beach. Tel: (032) 471-480. 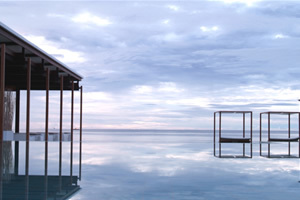 Opening in 1995, Chiva-Som made Hua Hin only the second destination in Thailand with luxury spa facilities. Since that time, Chiva-Som has become world-renowned as a health and wellnes resort and Thailand has become the second highest ranked spa destination of the world with Chiva-Som as the number one Health Resort in Asia. In 1995, there were only a few facilities in Hua Hin with the name Resort. Soon, just about any hotel with both a garden and a pool became a resort. Nowadays, throw down a tatami mat, light some incense and you can put up a sign offering Aromatherapy Massage. 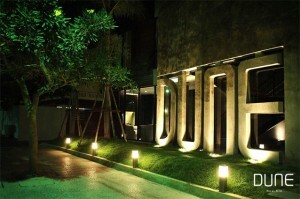 This is not to say that there are not many outstanding facilities in Hua Hin. While not even all the luxury resorts can offer the same standards as Chiva-Som, not all charge almost $1,500 per person per night for their basic treatment package, or are able to offer the wide variety of health and treatment packages as does the premier spa in Asia. The Anantara Spa Hua Hin is another Hua Hin Spa that is consistently rated high by Condé Nast Traveller. Each of the Spa’s seven suites is set in its own personal garden courtyard with dual alfresco ‘rain’ showers suspended in bronze cages modeled on traditional Thai artifacts. From ancient Ayurvedic massage therapy and dosha-balancing color therapy steam baths to body butter skin nourishing and rehydrating facials that use ancient Thai herbal recipes, the menu at the renowned Anantara Spa Hua Hin has the perfect rejuvenating ritual for every body – and soul. Six Senses Hideaway is located in the quiet area of Pranburi to the south of Hua Hin and provides calming views of the Gulf of Siam. It is set among 20-acres of landscaped lush tropical gardens with lotus ponds. 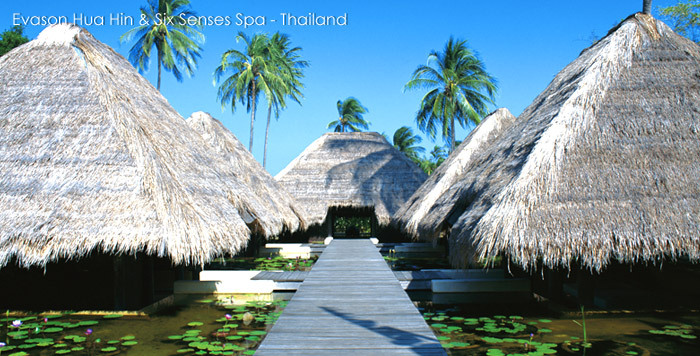 The multi-award winning Six Senses Earth Spa brings a new paradigm to holistic wellness in a natural eco-environment. The spa is built entirely from a mixture of clay-like mud. Emphasis at the Earth Spa is very much on skin foods with many of the ingredients freshly picked for simply delightful body-nourishing and feel-good therapies. Wellness activity sessions such as yoga and meditation are offered and Private Spa Suites are an option with several villas. Many couples come to spas in Hua Hin for special Spas for Couples. In addition to the spas above, The AKA Resort, west of town near the new Black Mountain Golf Club, The Dhevan Dara Resort & Spa, on the slopes of Khao Hin Lek Fai, and the high rise Hilton Resort and Spa right on the beach in central Hua Hin all over special packages for couples. The S’mor Spa Village in nearby Khao Takiap also offers packages for couples. Most Hua Hin spas also offer special Thai Spa Cuisine which is low fat, low salt and low sugar. Only the leanest meats are used and few oils. Most meals consist solely of fish, grains and pulses. The Chiva-Som even has its own organic farm just north of Hua Hin providing the freshest ingredients and flavors. Massage is normally the most popular of techniques offered at spas in Hua Hin and there are many types, the most popular of which is Thai massage. In addition to spas, Thai massage is available though out Hua Hin, even on the beach. Foot massage is also popular among tourists and Thais alike and this is also available at many places in Hua Hin. Regardless of the type of spa treatment you desire, or the depth of your pocketbook, you’re sure to be pampered, detoxed, and rejuvenated by the wide variety of spa facilities in Hua Hin. Ban Boosarin. Air-con rooms, TV, telephone, fridge, balcony, hot water. 88 Poonsuk Rd. Tel: (032) 512-089. Chanchai Resort. Air-con rooms, bungalows, camping, playground. 117/1-18 Petchkasem Rd. Tel (032) 511-461. Fresh Inn Hotel. Air-con rooms, patio restaurant. Across from the Melia at 132 Naresdamri Rd. Tel (032) 511-389. Hua Hin Sport Villa. Air-con rooms, club house, swimming pool, sauna, fitness center, snooker, mini-theater. 10.95 Petchkasem Rd. Tel: (032) 511-453. Jed Pee Nong Hotel. Air-con rooms, swimming pool, seafood restaurant. 17 Damnoenkasem Rd. Tel: (032) 512-381. Karoon Hut. Air-con and fan rooms, TV, seafood restaurant. 80 Naresdamri Rd. $15-24. Tel: (032) 530-242. Pananchai Hotel. 33 Air-con rooms, hot showers, TV, VDO, restaurant in 6-story building. 71 Napkhehad Rd. $16-24. Tel: (032) 511-707. Sand Inn. Air-con rooms, restaurant. 38-38/4 Poonsuk Rd. Tel: (032) 532-060. Tananchai Hotel. Air-con rooms, TV, frig, restaurant. 11 Damrongrat Rd. Sirin Hotel. Single and double rooms, TV, fridge, private balcony, restaurant. Damnoenkasem Rd. Tel: (032) 511-150. Subhamitra Hotel. Fan and air-con rooms, swimming pool, beach front restaurant. 19 Amnuaysin Rd. Tel: (032) 511-208. Royal Beach Guest House. Just off the beach about 1 km from the center of town. Pool, bar and coffee shop. Air-con rooms, cable & video. Private baths. 113/12-13 Phetkasem Rd. Tel: (032) 532-210. All Nations Guesthouse. Fan and air-con rooms, bar and restaurant. Computer games for the kids. Bar-B-Q dinners nightly and now an open-air lounge on the top of the building.10-10/1 Dechanuchit Rd. Tel: (032) 512-747. Pattana Guesthouse. Thai-Dutch guesthouse about 2 minutes from the fishing pier. Outdoor restaurant opening mid-December. 13 Fan rooms. 52 Naretdamri Road. Rooms $5-7. Tel: (032) 513-393. A & B Guesthouse. Air-con rooms, TV satellite, VDO, pool. 113/17-18 Petchkasem Rd. Tel: (032) 532-340. Baan Somboon. 13/4 Soi Kasem Samphan, Damnoenkasem Rd. Tel: (032) 511-538. Fu-Lay. Air-con rooms, hot water, TV, VDO. 110/1 Naresdamri Rd. Tel: (032) 513-670. Leng Guesthouse. Air-con rooms, TV, fridge, swimming pool. 113/14 Petchkasem Rd. Tel: (032) 513-546. Nilawan A. Guesthouse. Air-con rooms, restaurant, pool table, swimming pool. 113/18 Petchkasem Rd. Tel: (032) 512-751. Mod Guesthouse. Fan and air-con rooms. 116 Naresdamri Rd. Tel: (032) 512-296. Sirima Guesthouse. Air-con rooms. 33/3 Naresdamri Rd. Tel: (032) 511-060. Anantasila Villa. Beach front air-con rooms, restaurant, TV, swimming pool, mini golf. Near Khao Takiab at 13/5 Huadon. Tel:(032) 536-364. Takiab Beach Resort. Air-con rooms, swimming pool, conference hall. 33/5-6 Khao Takiab Rd. Tel (032) 512-639. Hua Hin Bluewave. 37-38 Baan Hua Don. Tel: (032) 513-140. Nern Chalet Hua Hin. 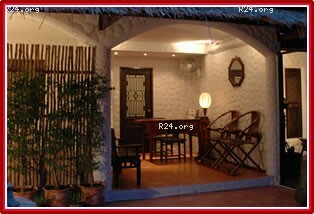 Air-con rooms, private balcony, seafood restaurant. 144/7 Nong Kae-Takiab Rd. Tel: (032) 511-288. Vegus Hotel. Air-con rooms, restaurant. 1/6 Takiab Rd. Tel: (032) 536-223. 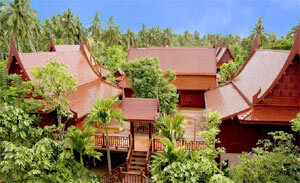 This resort offers Thai style houses and villas in a luxurious garden setting. Each is fully equipped with satellite TV, Wi-Fi, etc. 4 Pool villas. Spa with 7 treatment rooms, fitness room, salon, meeting rooms, International and Thai restaurant, and bar. An amazing resort for a quiet getaway from Bangkok or as a day trip from Hua Hin. Visit the nearby floating market, see the fire flys in the evening and just relax.